New York chefs, particularly of the haute French persuasion, have long held a special affinity for Japanese cooking—inspired by its zen seasonality, spare and delicate plating, and reverence for the finest ingredients from both land and sea. And like Quentin Tarantino highlighting his favorite Hong Kong directors, a few have imported chefs they admire from across the Pacific and opened restaurants for them in Gotham. 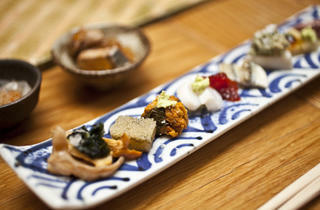 In 2011, David Bouley launched his first such curatorial effort: the long-delayed Brushstroke. A collaboration with Osaka’s Tsuji Culinary Institute, the restaurant brings kaiseki cuisine—the intricate, formal multicourse meals at the pinnacle of haute Japanese cooking—into a surprisingly relaxed and accessible setting. Bouley puts the remarkable cuisine of young chef Isao Yamada at the fore here, and hasn’t muddied the waters by getting too hands-on with the place. 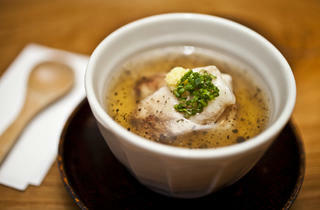 The chefs, designers, and manager are all Japanese—and promisingly, for that matter, so are quite a few patrons. 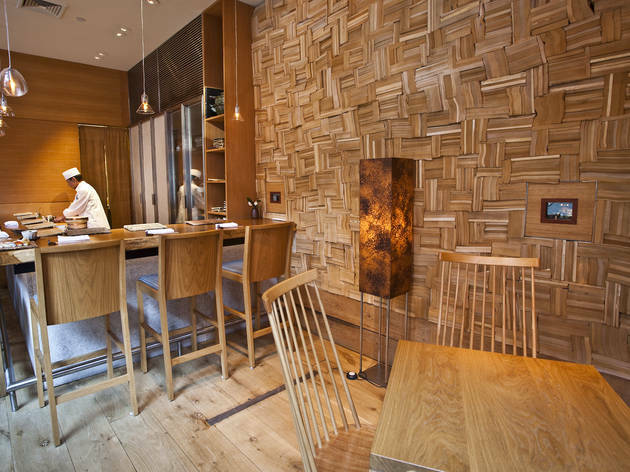 The space, by Tokyo design stars Super Potato, features an artful mix of the serene and playful—blond wood walls in the dining room giving way in the adjoining Noodle Bar to 25,000 paperback books stacked pages out so they resemble crisscrossing planks. Despite the clean, elegant cooking, there’s great energy to the place—from its breezy service and jazz soundtrack to the furious (but silent) rush in the huge open kitchen. 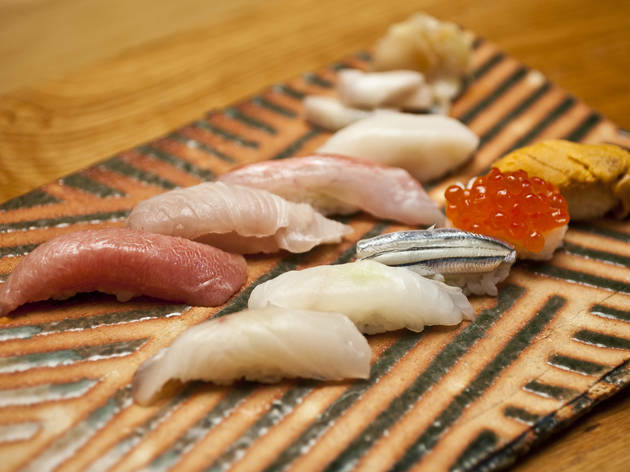 Yamada, brought west from Fukuoka in 2005, has spent his years in New York developing recipes for this long-promised restaurant—testing the 5,000 seasonal dishes now rotating nightly through the five- and nine-course tasting menus, as well as on the sushi and à la carte dockets. 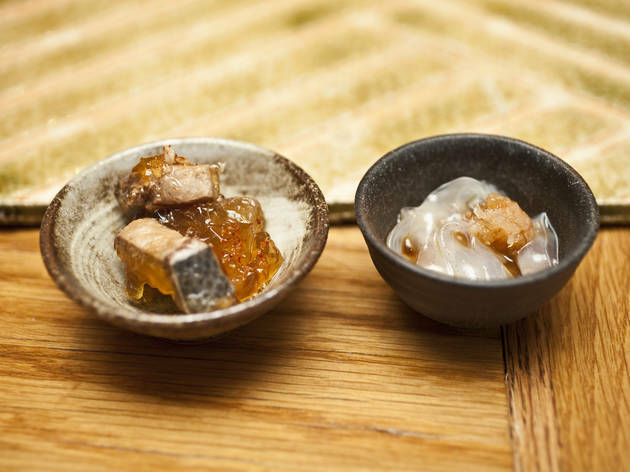 The dishes, gorgeously plated on handmade Japanese stoneware, flow like parts of a symphony, from muted petals of raw kombu-wrapped sea bass one night to a rich and restorative black truffle custard, with crab underneath and sweet mirin on top. 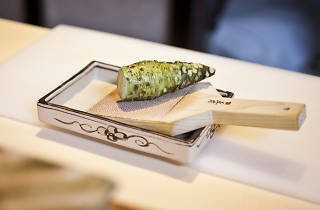 A feast here builds toward a subtle climax, asparagus tips with pristine lobes of uni leading to silky black cod with watercress sauce and crumbled pistachios. Beautiful pink slivered duck breast with smoky charred eggplant yields to earthy stewed pork cheeks (an inspired swap for ubiquitous belly) with cider reduction and green apple puree. 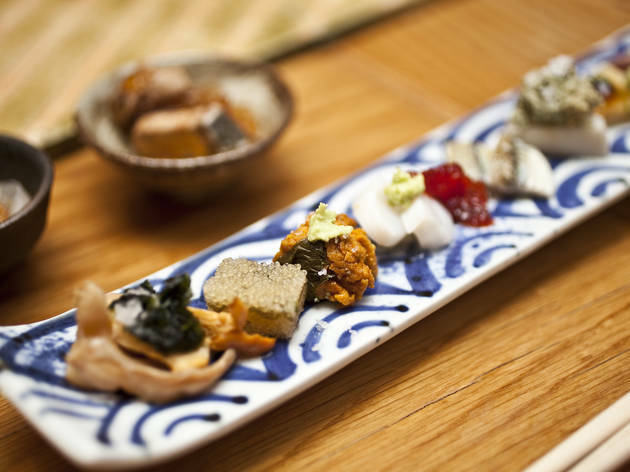 The best chefs in America owe a great deal to the kaiseki traditions at play here—our most modern tasting menus are born of their ancient rhythms. In keeping with the basic tenets of this culinary art form, Yamada’s savory procession concludes with a rice dish—your choice of either top-notch chirashi (sashimi arranged like a garden on warm vinegared rice) or seafood and rice cooked on a stove top in a clay casserole (the great crusty grains, on a recent evening, hiding a simple, delicious mix of lobster meat and salmon roe). 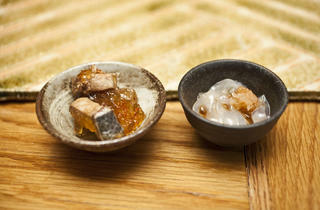 Delicate creamy soy-milk panna cotta, followed by evanescent sugared rice cakes, wraps things up here with a whisper. Peering into the busy kitchen after that very last bite, you may be expecting a curtain call. 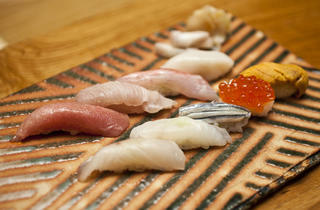 It’s an impressive performance—culinary Kabuki—priced and paced like a Broadway show. Drink this: Begin with a light and refreshing shochu cocktail, like the Sagano with Japanese cucumber before diving into the list of rich Japanese whiskies, which may encourage you to linger past dessert. 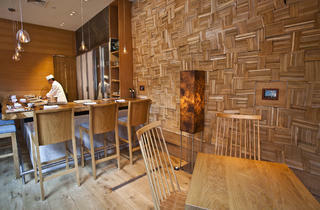 Sit here: The new Noodle Bar at Brushstroke doubles as a full bar, and no reservations are required. In the main dining room, request a seat at the kitchen counter for a front-row view of the chefs at work. Conversation piece: Brushstroke grew out of conversations begun in the 1990s between David Bouley (who first visited Japan in 1996) and Yoshiki Tsuji, head of the Tsuji Culinary Institute. 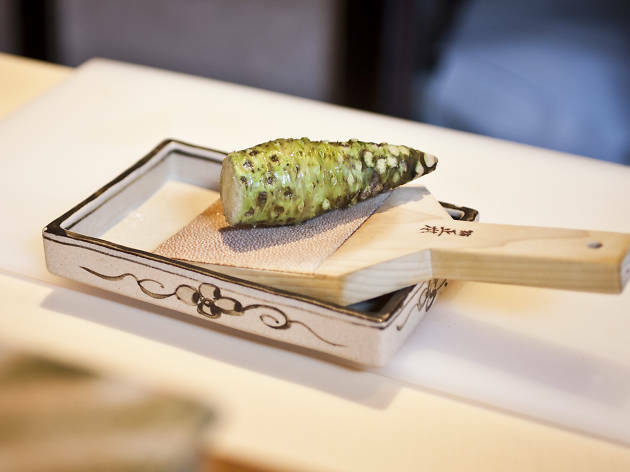 After bringing Isao Yamada to New York, Bouley began serving Japanese dishes at his casual outpost, Upstairs at Bouley, since closed. 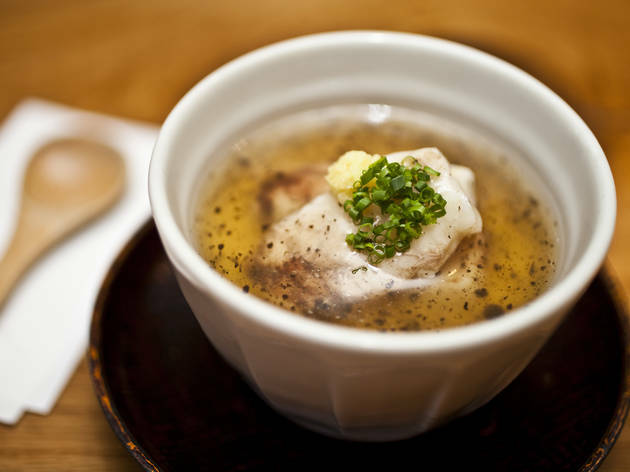 Back in 2010, he launched a test run for Brushstroke in that space, featuring an abbreviated form of the restaurant’s kaiseki cooking. I recently got back from a 3 week vacation in Asia and have found myself missing the food. When my friend suggested we catch up over dinner here I was delighted! Each bite from each portion melted perfectly in my mouth! Though the two of us split an appetizer and entree (it was January and we were on a cleanse!) the decadent food was worth the price point!